Daimler was a German marque (there was also a British one) who set up an Austrian subsidiary in 1899 (it became independent around 1905). These cars were built under the Austro-Daimler marque until 1934 when Austro-Daimler AG merged with Steyr, becoming Steyr-Daimler-Puch. During the 1930s, the company produced some very nice, large cars. As you can see above, they were doing the same thing before WWI. The weird thing about this car is that it carries no chassis plate and the only markings on the car at all are on the radiator, which appears to be British. It is thought that this might be one of very few Austro-Daimlers built in and/or for the U.K. The engine is not native to this car, but it has probably been in it for most of its life. It’s a Wisconsin M-Series, an 11.9-liter straight-four monster. The bodywork is British and likely from a major coachbuilder, but no one knows which one. The stuffing is coming out of the front seats, making it a prime candidate for restoration. Oh, and this car has appeared in a couple of films, namely Chaplin and Titanic. It should bring between $120,000-$140,000. Click here for more info and here for more from this sale. 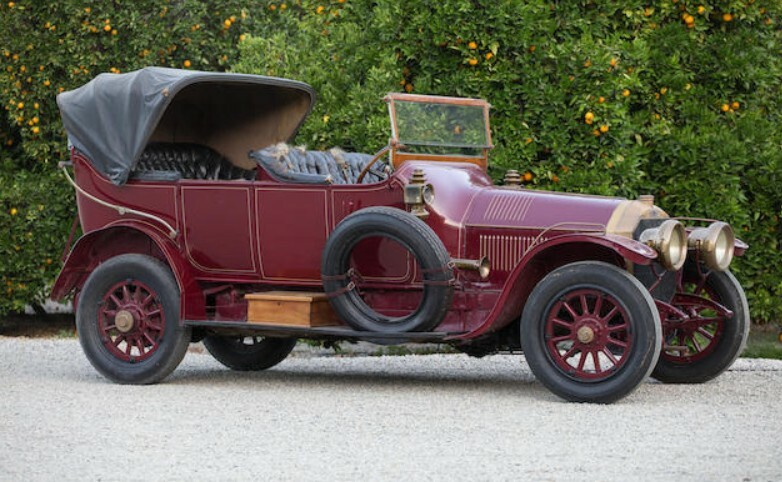 This entry was posted in Uncategorized and tagged 1912, auctions, austro-daimler, Bonhams, cars, classic cars, touring, victoria by classiccarweekly. Bookmark the permalink.